She is just so little, her tiny face pure innocence. Her big brown eyes search my face suspiciously. And for just a moment, her eyes hold mine. I dare not blink, for fear of losing this moment. Carefully, gently, I touch her hand. I can protect you, I whisper. And the silence deafens us both. Her fingers gently curl around mine. And we sit like statues. Will you come with me? I whisper. She is what we call a ‘Foundling’. These are children who are simply found. Some of them get lost in the swirling chaos of the streets. Some are left intentionally for someone else to claim them. Some are orphaned and find themselves all alone with no-where to go. No one really knows their age. No one knows their birthday. Sometimes, they don’t even know their own name. They have no rights. No birth certificates, no homes, no family, no one to hold them, no one to protect them, no one to love them. And no one to advocate for them. We have given a name to many of these children; a name they can call their own. We have loved them until a family has come forward willing to adopt them and be their family. We are passionate about the ‘foundling’. Because we believe that God sees them. God knows who they are, where they came from and what their future will be. For more inspirational poems and stories, please visit the life stories page on our website: www.angelhousephilippines.org. As the saying goes, ‘Christmas is the time for giving’, but what about the rest of the year? As a residential care home for young children, Angel House is open 365 days a year and ready to receive abandoned, neglected and orphaned children that need our specialist care. Your funds help to keep the lights burning brightly in Angel House every day of the year; a beacon for despairing parents that seek shelter for the infants they can no longer care for. We help these children to heal their emotional wounds and ensure that they have a loving family that will care for them and give them a better future. So please don’t just donate to your favorite charity at certain times of the year and instead become a monthly recurring donor, that way you can spread your giving through the year and give Angel House a regular income that covers our daily expenses. We all love our children every day of the year and celebrate their unique personalities each and every day, so after you have read this newsletter, please give your children a hug and tell them how much you love them (even if they are hormonal teenagers, we all need a hug and to be reminded that we are loved). Then visit our Global Giving page and give a donation of love for our little angels, any day of the year! 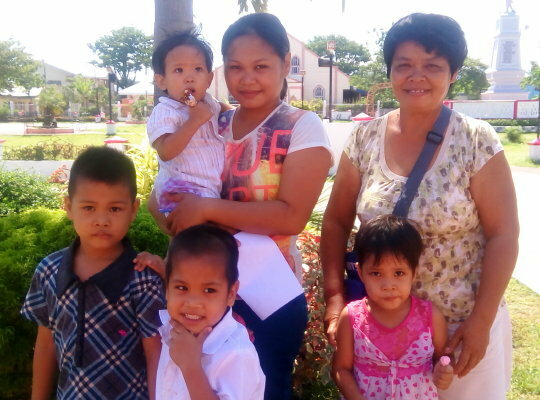 Last week we gave three siblings back to their family in Cateel, a coastal community in the north of Mindanao and a four-hour drive from Angel House. These young children were neglected and malnourished when they arrived in August last year and the two-year old girl still has some health issues resulting from poor nutrition before coming to Angel House. After months of preparation the family was ready to be re-united with their children and the local social worker will monitor their progress over the coming months. The northern seaside town of Cateel was devastated by a typhoon in 2012 that left over 1,000 dead and thousands of families homeless; this has led to many psycho-social problems within the community resulting in many referrals of children to Angel House from that area over the last few years. Government housing projects for the homeless families have been poorly managed and many families have refused to move in to the badly constructed homes. For those that relied on fishing and farming for their livelihood, the typhoon also took away their only source of income. Typhoons, earthquakes and tsunamis have been very much part of the international news over the past month; everyone that watches the distressing scenes on TV of dead bodies and homeless people desperate for help from government agencies and NGO’s finds it emotionally disturbing. Some of you may even have given a donation to one of the many organizations that are doing their best in a very challenging and dangerous environment, such as in Indonesia. The Philippines also sits on the Pacific ‘ring of fire,’ which means we also have many earthquakes and the possibility of a tsunami. Every year our country also experiences several typhoons that bring devastation to many communities. But natural disasters like typhoon Pablo that devastated Cateel make the headlines for a few days and then the world moves on to other news, even though the effects on the families involved are long lasting. As with the three little children that were re-united with their family, it can create problems for those who were not even born at the time of typhoon Pablo. Angel House is always willing to offer our professional assistance to the most vulnerable; the small children left in poverty and neglect. With your support through Global Giving we will be ready and prepared for the next natural disaster, whether it be a typhoon, earthquake or tsunami. The first three years of a child’s life are the most important in terms of physical and mental development and that is why Angel House Orphanage Foundation plays such a vital role in caring for children at this critical age. We provide these infants and toddlers with a nutritional diet supplemented by vitamins, as well as plenty of physical and mental stimulation. However, early intervention is the key to success and sometimes young children arrive with already stunted growth due to malnutrition and other medical problems due to neglect or poverty. 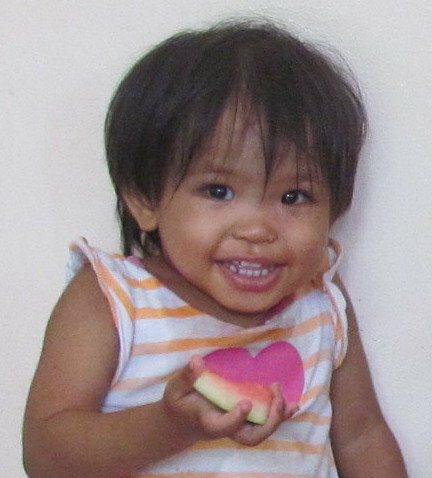 VN is one such child; she came to us in August of last year at eleven months old, along with her two older siblings. On admission she weighed only 6.5 kg (13 lbs) and 69 cm in length, too weak to support her own weight and her skin covered in rashes. She has continued to be a fragile little girl with frequent illness and skin problems that make her very irritable. VN only started walking at one year and five months and even now she is very unsteady on her feet. 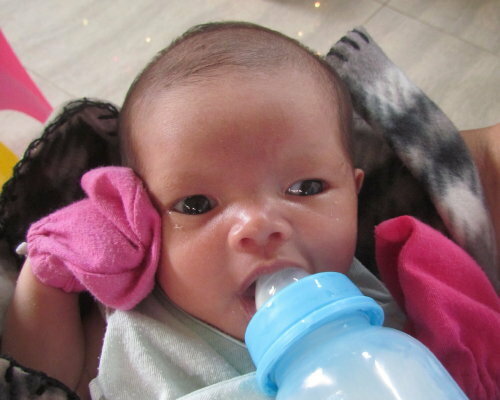 With your continued support through Global Giving, Angel House can give children like VN a balanced diet and direct medical intervention when required, including physical therapy and mental stimulation through singing, story-books and other educational activities. Together we can make a big difference to their lives and give them the opportunity of a better life; when VN is happy her whole face lights up with a big smile! These three siblings are our elementary students. We all know how important education is in improving the lives of children here in the Philippines and Angel House makes sure that our children receive all the support they need in achieving their academic potential. We always give them words of encouragement and applaud every new achievement, as well as giving a daily tutorial for all children from three years and above. This emphasis on education will hopefully enable our children to follow their dreams and perhaps even go to college. It is well known that a healthy diet is also important for a child to make good progress in school; so many Filipino children go to school hungry or do not have any lunch, making it hard for them to pay attention in class and achieve success. All our children are given three nutritious meals every day as well as morning and afternoon snacks; plenty of ‘brain food’ to help them concentrate in school. The first few years of a child’s life is a critical period in cognitive development and that is why we start as early as possible in stimulating their brain function through imaginative play, picture books, singing and educational toys. We are constantly talking and interacting with them to develop their physical and mental ability. Your financial support through GlobalGiving allows Angel House to purchase uniforms and essential school supplies for our children attending day-care and elementary school, as well as providing the healthy and fresh food that gives them the energy to focus on their studies. Together we can provide a better future for the children of Angel House.